So welcome to the first monthly post on our amazingly popular Cake Club Subscription Boxes! When I launched these boxes in March, I had no idea how popular they would be and I’m so sorry so many of you missed out on the first month after they sold out in a few hours. We have been working day and night to source new exciting products for April’s Box and increasing the number of subscriptions we could physically make in time. I wanted to create the subscription boxes so that people could try new and exciting products that we have never sold before, at an amazing price, and feel like part of a club where everyone can share their ideas and creations for the products. We had a few requests last month for a few more ideas and inspiration for the boxes other than those printed inside the box, so I thought a blog post with ideas for each product would be helpful and get you excited thinking of things to do with your new goodies! So without further ado, introducing The Bling Box! If you are lucky enough to have one of these awesome boxes then I’ve included tonnes of ideas for you below! I know you are a super creative bunch and can probably think of a million more ideas than me, so please tag: #IcedJemsCakeClub on Social Media when you create anything using goodies from the box so I can see! So here I have used the fabulous Diamond Cupcake Toppers, the Bling Mix Sprinkles and Metallic Washi Tape! 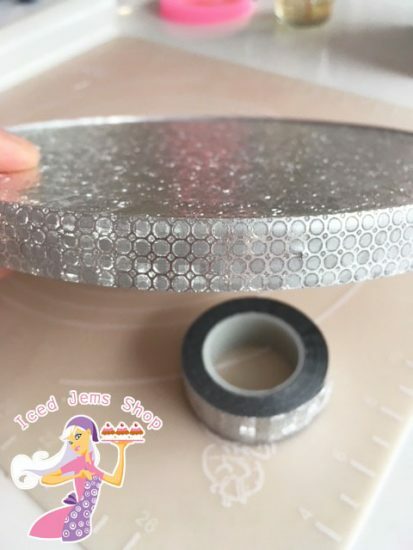 The Washi Tape you get in your box will vary in design but it will be metallic to match your other goodies. The Cupcake Toppers are perfect for pushing into buttercream swirl cupcakes for a wow factor finish with little effort. Here I have also topped with a few sprinkles, and decorated a plain white cupcakes box with the washi tape to give it a little extra detail. The cupcake is piped with a 2D Nozzle, this nozzle and the single cupcake boxes are available online and in store. All our Washi Tapes are also the perfect width for covering your cake drums with! The Tapes have a sticky back so stick straight to the drum with little effort, much less faff than ribbon and double sided tape! Rose Gold is more popular than ever, especially with Wedding Season approaching! 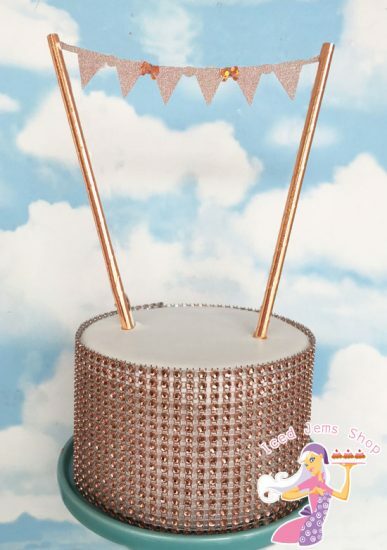 The Bling Box contains a lovely Rose Gold Cake Bunting Topper and 1 Yard of Rose Gold Diamante Cake Ribbon. 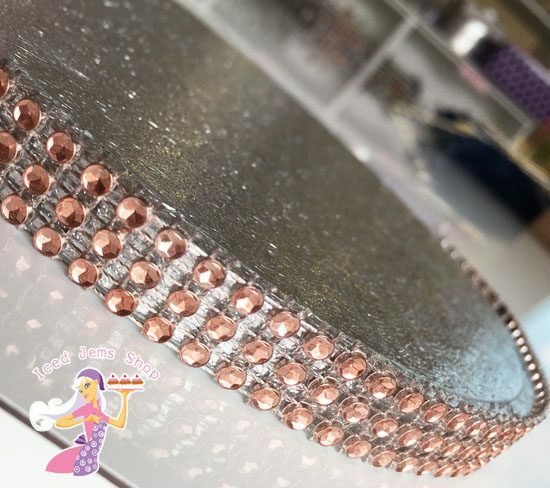 We sell the Diamante Cake Ribbon in lots of different colours for just £2 per metre, it’s really tall too so can be cut down as required easily. 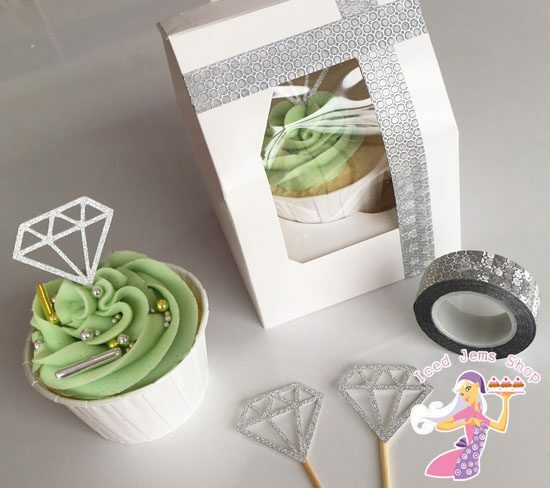 If you want to easily give your cake the wow factor you can wrap diamante ribbon around the sides of the cake. You can also cut down thinner strips to go round your cake drums. I’ve also made homemade cake stands before using different sized cake drums with a strip of diamante ribbon around them, stacked on baked bean cans covered in glittery paper! 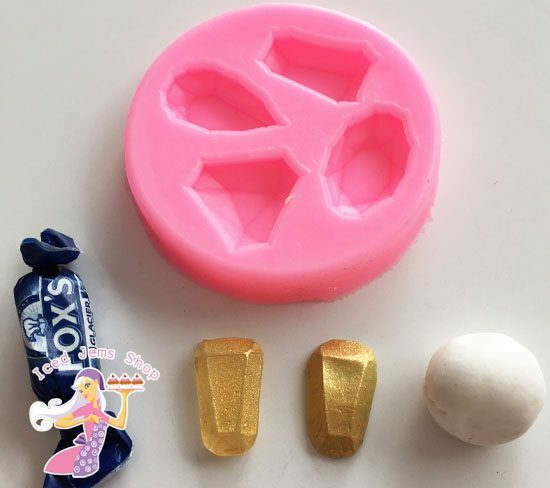 The Silicone Sugarcraft Mould included makes some awesome edible gemstones and can be used with; Fondant, Chocolate, Jelly, Melted Foxes Mints, Isomalt and more! The picture above shows you the different finishes you get with Modelling Paste versus melted Foxes Mints. I really like the effect with the mints as it is more transparent and gemstone like. For each type, I dusted the finished gem with our Gold Edible Dust. 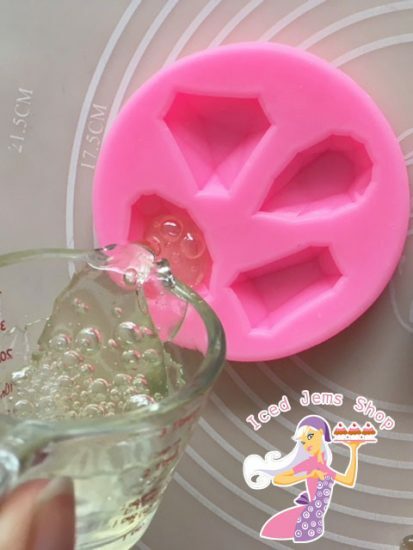 For the Foxes Mints method, I spray a small of Cake Release Spray into the mould, then placed a few Foxes Mints in a tiny jug (available here) and microwaved them for 20 seconds at a time until melted, they set quite quickly so make sure you work quick! Once melted, pour into the mould then wait just a few minutes for them to set before turning out and releasing. You will have some awesome transparent gemstones and you can use our Edible Lustre Dusts to finish them off in different metallic colours. 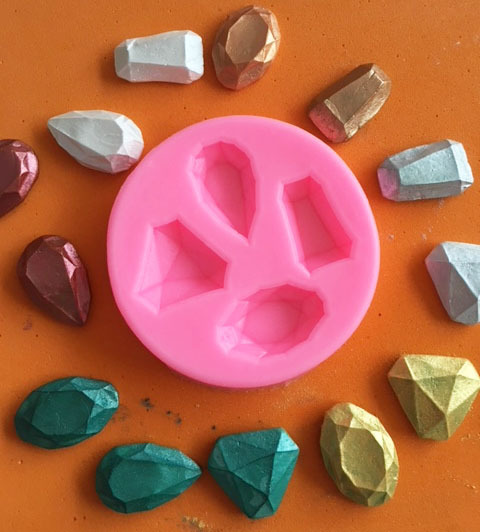 Here are the Gems I made with modelling paste instead of the Foxes Mints! I used; Ruby, Pearl, Rose Gold, Silver, Pure Gold and Teal Lustre Dust to finish them off. I actually used a black modelling paste for these too instead of white as it really highlights the colours and makes them shine. Edible Gold Leaf! I really wanted to include a sheet of 24ct Edible Gold Leaf in this box, I know its something a lot of cake makers haven’t tried before because it’s quite expensive or they’ve not had someone ask for it. I want the boxes to be about trying new things and learning new skills so I really hope you enjoy trying this out. Edible Gold Leaf is super delicate and comes on a transfer sheet and tissue paper cover. When working with edible gold leaf make sure you have clean dry hands, a soft paintbrush and you don’t have any draughts coming through in the room you are working. Gold Leaf is best attached to a slightly sticky surface, freshly applied fondant is often sticky enough, but you can use a tiny amount of water on a paintbrush to make any other surfaces sticky enough for the gold leaf to stick. Remove the tissue paper cover and place Gold Leaf face down onto your surface if you want to completely cover something, then peel away the transfer paper. 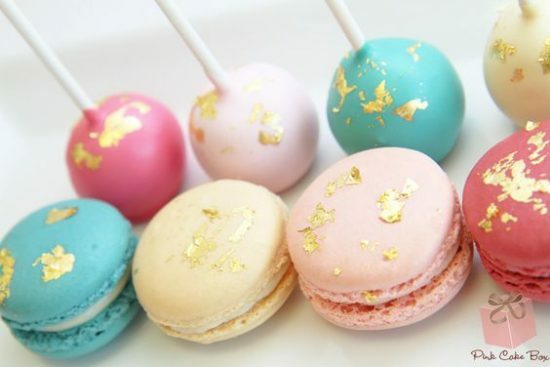 If you want a more delicate flake effect like in the fabulous Macarons and Cake Pops from The Pink Box shown above, use a dry paintbrush to pick up flakes of the gold and place them gently onto your surface. 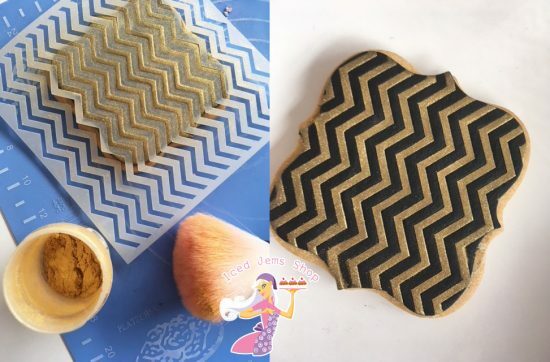 The chevron stencil gives you amazing patterns for cupcakes, cookies and cakes! Here I used the stencil on Black Fondant, I pushed the stencil into the fondant gently, this keeps in place and also gives you a slightly raised area for the pattern which I think looks amazing. Brush on Edible Gold Dust using a large blusher style brush, make sure you brush gently in a straight down motion, dabbing the dust on until you have full coverage. Blow any excess dust away before peeling back the stencil to avoid ruining the clean sharp edges. I think gold on black looks amazing and really highlights the amazing gold colour. 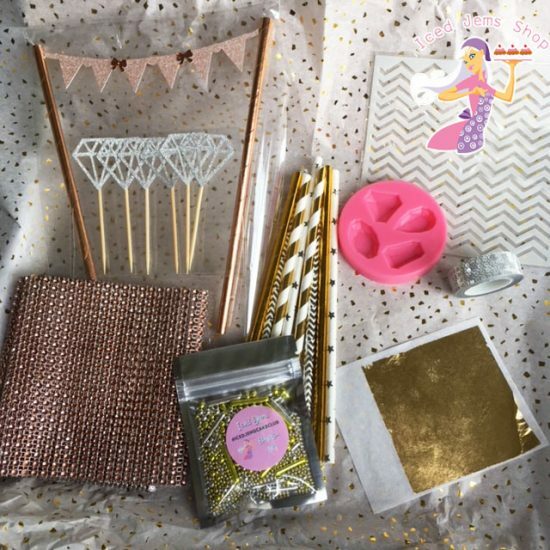 The box also includes a selection of Metallic Paper Straws! I’ve actually got a whole blog post on creative ways to use paper straws if you fancy doing something different to simply using them in your drinks! Paper straws are a great biodegradable alternative to plastic straws and we have an awesome selection in the shop! Last but certainly not least here’s a lovely close up of our amazing new Bling Mix Sprinkles created for this box! 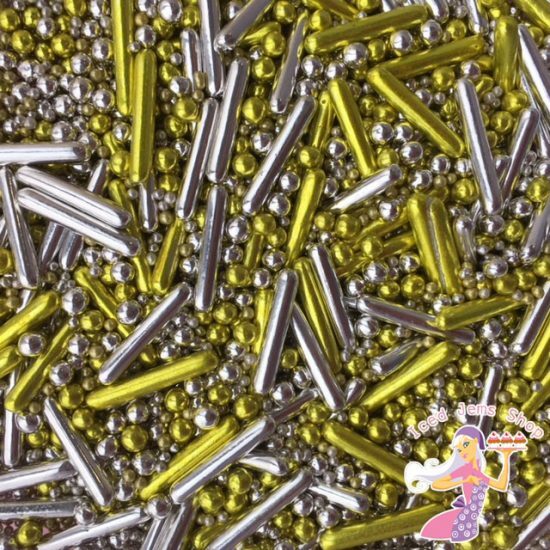 Incredible shiny Sprinkle Rods with Pearls and 100s & 1000s in Gold and Silver! I really hope you enjoy receiving your subscription boxes this month!